Montreal Canadiens' coach Guy Carbonneau says he credits a holiday road trip that saw his team go 3-1-2 for turning their season around. While the rest of the population was invading shopping malls in preparation for a festive holiday season, Guy Carbonneau and the Montreal Canadiens were silently nervous about history repeating itself on their upcoming road trip. Turns out, they had plenty to celebrate, too. When asked on a recent conference call to pinpoint the moment when he realized the Habs could truly be a special team this season, Carbonneau pointed to the noticeable differences between their 2006 and 2007 holiday sojourns south of the Canadian border. One stopped them dead in their tracks. The other sent them soaring. "I really think that the biggest step for us was the trip at Christmas, not because of the opponents that we had, but just because of what happened last year," Carbonneau said. "I thought last year our team was really playing strong hockey. We were doing really well, and then the trip that we had starting just before Christmas time didn't go the way we wanted. From there it was really kind of a struggle right up until about three weeks from the end of the season where we couldn't catch our breath, couldn't catch anything. "I thought this year we had the same start, kind of similar to last year. We also had a huge trip during the holiday time. I think everybody was kind of nervous about that trip. Once we came out of it doing really well, I thought that was a big thing." The Habs were 21-8-5 for 47 points entering a four-game road trip beginning in Boston on Dec. 23, 2006. They were 16-12-5 for 37 points entering a six-game road trip beginning in Washington on Dec. 20, 2007. They cooled off last season thanks to a disastrous 1-3 trip. They couldn't swim out of the deep end until St. Patrick's Day when they began a five-game winning streak, but it wasn't enough. Montreal won only 21 more games and their 90 points weren't enough to make the playoffs. This season, the Canadiens went 3-1-2 on that holiday road swing. Entering this weekend they had won 25 of their 40 games since to march into second place in the Eastern Conference with 98 points. They locked up a playoff berth a week ago. You see the difference between '06 and '07? Striking. "I knew at training camp with the team that we have, the additions that we made, that we were going to be a better team, but so many things can happen during the course of the season," Carbonneau said. "I don't deny that I've taken a lot of pride in trying to prove people wrong, but I also knew that there were a few things that had to happen during the start of this year to make these things happen." One has to be luck, which at least until now has been on the Canadiens' side. "We haven't had that many injuries," Carbonneau said, referring to the Canadiens' 91 man-games lost to injury, a relatively low number. Another is depth. The Canadiens have a bundle of it, so much that their healthy scratches could be regular contributors on many teams and some capable defensemen, such as Mark Streit and Mathieu Dandenault, were moved to forward just to log ice time. Until Mike Komisarek's recent lower body injury, which is expected to sideline the team's best defensive defenseman until the playoffs, the Canadiens were still seven-deep on the blue line on most nights even with Streit and Dandenault playing up front. "We were lucky that last year we had a guy like Mark Streit … but we felt having him on defense with Francis Bouillon, our defensemen were a little too small," Carbonneau said. "So I asked him one day to play forward. He never complained and he did it really good. We tried the same thing again this year, because we had some extra defensemen. Dandenault was cut from the same rock, and they've been helpful. "It's just in their attitude," he continued. "They've had a good attitude about it since the start. You know, we see now with Mike Komisarek being out, that it pays off to have those kinds of guys around." Unlike last season, when Montreal had a couple of stretches of futility, including separate losing streaks of six games and four games, this season the Canadiens have never gone more than three straight games without a point. They've done it only once. "Most of our players, their game has been constant," Carbonneau said. "Our goaltenders have been solid, whether it was Carey (Price) or even (Jaroslav Halak). We haven't had a slump. So, all of those things together, we kind of knew that we had a better team than what people thought." Carbonneau deserves some credit, too. He has grown up as an NHL head coach. 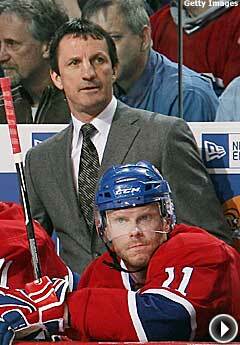 "I'm thinking more and I'm acting more as a coach now than as a player," Carbonneau said. "Sometimes I thought of when I was a player I used to do this. It doesn't really work in the long-term, so I'm acting more as a coach now than I used to." Carbonneau also said he has a greater understanding of how much his decisions actually impact games. "The year that I had last year has really helped me this year how to react, how to act," he said. "Quick decisions. Bench management. How to use players. I understand now. Power-play wise. Penalty-wise. At the end of the game, up one or down one. Now I have a better idea of what I can use in those situations." Such as his gang of healthy, capable and consistent players.